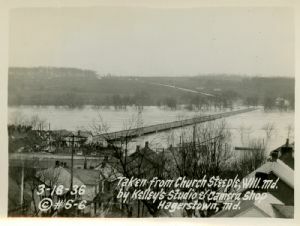 This Kelley photograph taken from the church steeple in Williamsport shows the Potomac River and the Rt 11 bridge. The house on the far bank where the bridge reaches the West Virginia shore is Maidstone-on-the-Potomac. It was built by Evan Watkins, who operated Watkins Ferry on the Potomac. Floods, Maryland, Cumberland, History; Cumberland (Md. ),History.